John Hunt Morgan was born in Huntsville, Alabama, the eldest of ten children of Calvin and Henrietta (Hunt) Morgan. He was an uncle of geneticist Thomas Hunt Morgan and a maternal grandson of John Wesley Hunt, an early founder of Lexington, Kentucky, and one of the first millionaires west of the Allegheny Mountains. He was also the brother-in-law of A.P. Hill and of Basil W. Duke. Morgan's paternal grandfather Luther Morgan had settled in Huntsville, but a downturn in the cotton economy forced him to mortgage his holdings. His father, Calvin Morgan, lost his Huntsville home in 1831 when he was unable to pay the property taxes following the failure of his pharmacy. The family then moved to Lexington, where he would manage one of his father-in-law's sprawling farms. Morgan grew up on the farm outside of Lexington and attended Transylvania College for two years, but was suspended in 1844 for dueling with a fraternity brother. In 1846, Morgan joined the Freemasons, as had his father before him. Morgan desired a military career, but the small size of the US military severely limited opportunities for officer's commissions. In 1846 Morgan enlisted with his brother Calvin and uncle Alexander in the U.S. Army as a cavalry private during the Mexican-American War. He was elected second lieutenant and was promoted to first lieutenant before arriving in Mexico, where he saw combat in the Battle of Buena Vista. On his return to Kentucky, he became a hemp manufacturer and in 1848, he married Rebecca Gratz Bruce, the 18-year-old sister of one of his business partners. Morgan also hired out his slaves and occasionally sold them. After the death of John Wesley Hunt in 1849, his fortunes greatly improved as his mother, Henrietta, began financing his business ventures. In 1853, his wife delivered a stillborn son. She contracted septic thrombophlebitis, popularly known as "milk leg" -- an infection of a blood clot in a vein, which eventually led to an amputation and death in 1861. They became increasingly emotionally distant from one another. Known as a gambler and womanizer, Morgan was also known for his generosity. Morgan remained interested in the military. He raised a militia artillery company in 1852, but it was disbanded by the state legislature two years later. In 1857, with the rise of sectional tensions, Morgan raised an independent infantry company known as the "Lexington Rifles," and spent much of his free time drilling his men. Like most Kentuckians, Morgan did not initially support secession. Immediately after Lincoln's election in November 1860, he wrote to his brother, Thomas Hunt Morgan, then a student at Kenyon College in northern Ohio, "Our State will not I hope secede[. I] have no doubt but Lincoln will make a good President at least we ought to give him a fair trial & then if he commits some overt act all the South will be a unit." By the following spring, Tom Morgan (who also had opposed Kentucky's secession) had transferred home to the Kentucky Military Institute and there began to support the Confederacy. Just before the Fourth of July, by way of a steamer from Louisville, he quietly left for Camp Boone, just across the Tennessee border, to enlist in the Kentucky State Guard. John stayed at home in Lexington to tend to his troubled business and his ailing wife. Becky Morgan finally died on July 21, 1861. In September, Captain Morgan and his militia company went to Tennessee and joined the Confederate States Army. Morgan soon raised the 2nd Kentucky Cavalry Regiment and became its colonel on April 4, 1862. Morgan and his cavalrymen fought at the Battle of Shiloh in May 1862, and he soon became a symbol to secessionists in their hopes for obtaining Kentucky for the Confederacy. A Louisiana writer, Robert D. Patrick, compared Morgan to Francis Marion and wrote that "a few thousands of such men as his would regain us Kentucky and Tennessee." In his first Kentucky raid, Morgan left Knoxville on July 4, 1862, with almost 900 men and in three weeks swept through Kentucky, deep in the rear of Major General Don Carlos Buell's army. He reported the capture of 1,200 Federal soldiers, whom he paroled, acquired several hundred horses, and destroyed massive quantities of supplies. He unnerved Kentucky's Union military government, and President Abraham Lincoln received so many frantic appeals for help that he complained that "they are having a stampede in Kentucky." Historian Kenneth M. Noe wrote that Morgan's feat "in many ways surpassed J.E.B. Stuart's celebrated 'Ride around McClellan' and the Army of the Potomac the previous spring." The success of Morgan's raid was one of the key reasons that the Confederate Heartland Offensive of Braxton Bragg and Edmund Kirby Smith was launched later that fall, assuming that tens of thousands of Kentuckians would enlist in the Confederate Army if they invaded the state. Morgan was promoted to brigadier general (his highest rank) on December 11, 1862, though the Promotion Orders were not signed by President Davis until December 14, 1862. He received the thanks of the Confederate Congress on May 1, 1863, for his raids on the supply lines of Union Major General William S. Rosecrans in December and January, most notably his victory at the Battle of Hartsville on December 7. 0n December 14, Morgan married Martha "Mattie" Ready, the daughter of Tennessee United States Representative Charles Ready and a cousin of William T. Haskell, another former U.S. representative from Tennessee. Hoping to divert Union troops and resources in conjunction with the twin Confederate operations of Vicksburg and Gettysburg in the summer of 1863, Morgan set off on the campaign that would become known as "Morgan's Raid". Morgan crossed the Ohio River, and raided across southern Indiana and Ohio. At Corydon, Indiana, the raiders met 450 local Home Guard in a battle that resulted in eleven Confederates killed and five Home Guard killed. After several more skirmishes, during which he captured and paroled thousands of Union soldiers, Morgan's raid almost ended on July 19, 1863, at Buffington Island, Ohio, when approximately 700 of his men were captured while trying to cross the Ohio River into West Virginia. Intercepted by Union gunboats, less than 200 of his men succeeded in crossing. Most of Morgan's men captured that day spent the rest of the war in the infamous Camp Douglas Prisoner of War camp in Chicago, which had a very high death rate. On July 26, near Salineville, Ohio (actually closer to New Lisbon-now called just Lisbon), Morgan and his exhausted, hungry and saddlesore soldiers were finally forced to surrender. On November 27, Morgan and six of his officers, most notably Thomas Hines, escaped from their cells in the Ohio Penitentiary by digging a tunnel from Hines' cell into the inner yard and then ascending a wall with a rope made from bunk coverlets and a bent poker iron. 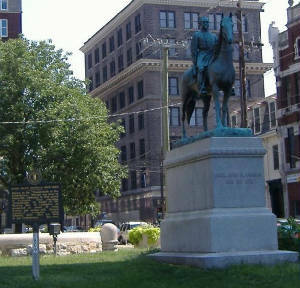 Morgan and three of his officers, shortly after midnight, boarded a train from the nearby Columbus train station and arrived in Cincinnati that morning. 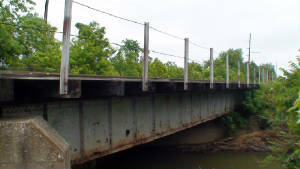 Morgan and Hines jumped from the train before reaching the depot, and escaped into Kentucky by hiring a skiff to take them across the Ohio River. Through the assistance of sympathizers, they eventually made it to safety in the South. Coincidentally, the same day Morgan escaped, his wife gave birth to a daughter, who died shortly afterwards before Morgan returned home. Though Morgan's Raid was breathlessly followed by the Northern and Southern press and caused the Union leadership considerable concern, it is now regarded as little more than a showy but ultimately futile sidelight to the war. Furthermore, it was done in direct violation of his orders from General Braxton Bragg not to cross the river. Despite the raiders' best efforts, Union forces had amassed nearly 110,000 militia in Illinois, Indiana and Ohio; dozens of United States Navy gunboats along the Ohio; and strong Federal cavalry forces, which doomed the raid from the beginning. The cost of the raid to the Federals was extensive, with claims for compensation still being filed against the U.S. government well into the early 20th century. However, the Confederacy's irreplaceable loss of some of the finest light cavalryin American history far outweighed the Union's replaceable losses in equipment and supplies. When taken together with the defeats at Vicksburg and Gettysburg, the loss of Morgan's cavalry brigade dealt another serious blow to Confederate morale. After his return from Ohio, Morgan was never again trusted by General Bragg. 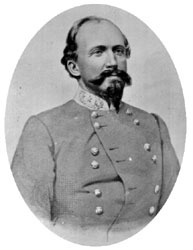 On August 22, 1864, Morgan was placed in command of the Trans-Allegheny Department, embracing at the time the Confederate forces in eastern Tennessee and southwestern Virginia. However, the men he was assigned were in no way comparable to those he had lost. Morgan once again began raiding into Kentucky, but his men lacked discipline and he was either not willing or able to control them, leading to open pillaging as well as high casualties. By now, Confederate authorities were quietly investigating Morgan for charges of criminal banditry, likely leading to his removal from command. He began to organize a raid aimed at Knoxville, Tennessee. On September 4, 1864, he was surprised and killed while attempting to escape capture during a Union raid on Greeneville, Tennessee. His men always believed that he had been murdered to prevent a second escape from prison, but it seems he was simply shot because he refused to halt. Morgan was buried in Lexington Cemetery. The burial was shortly before the birth of his second child, another daughter.